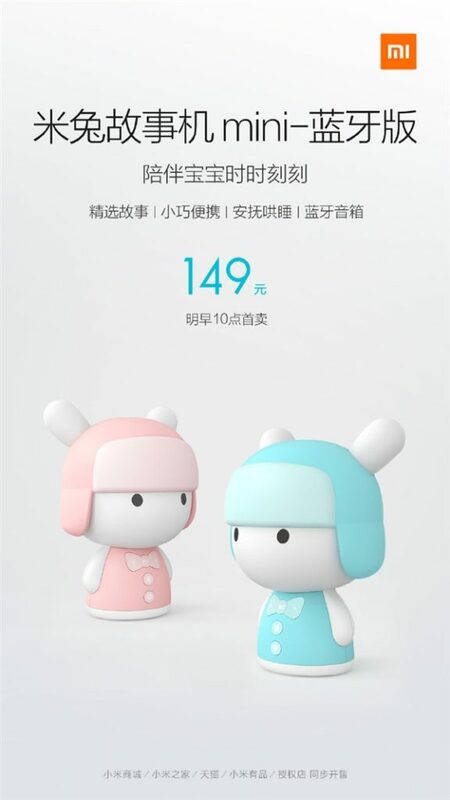 Xiaomi introduced a new product called xiaomi mi bunny story machine mini bluetooth version. This is the second model of this product that the company is launching. The product is inspired by the Mi Bunny smart assistant named Kuri. Around the same time, Xiaomi released a mini story mini-magazine Mi Bunny last year. This new product is the second version with a rabbit-like design, except that it supports Bluetooth. In terms of appearance, this version is not very different from the first model and comes with a compact, portable design with a height of 14cm. This device has 16GB of internal memory and can play music and help the baby to sleep. This device comes with preinstalled high-quality content that helps to increase the IQ's and intellectual growth. Use large data feedback to filter the child's favorite stories from more than 350 pieces of the best children's stories and poems. The most prominent feature of this version is the Bluetooth connection. By connecting Bluetooth, the xiaomi mi bunny story machine can be connected to smartphones and used as a speaker to play content from the phone or media player. This device will be available from Xiaomi Mall, TMall and other online retailers on February 1 at 10am. The price of 149 yuan is the same as last year's model price.